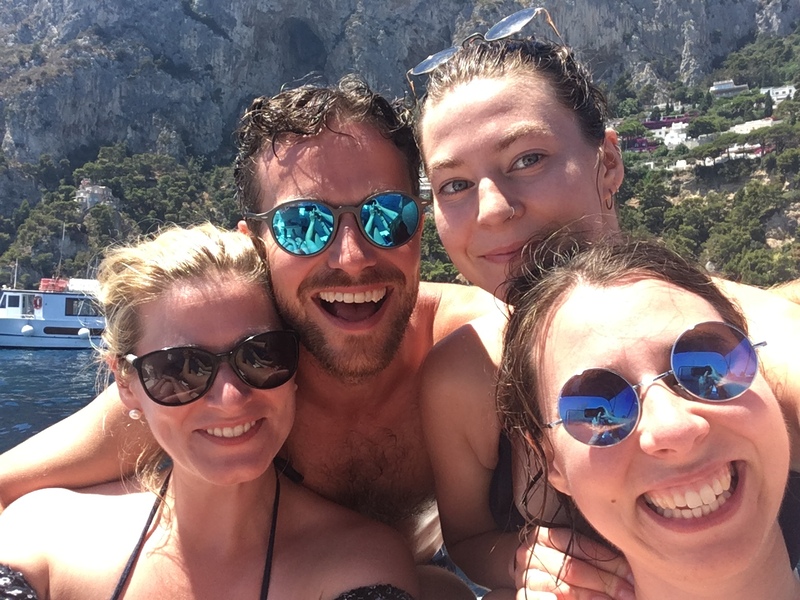 My Brother Ben has been spending time on Capri for years and he invited both my sisters and I to visit him this July. 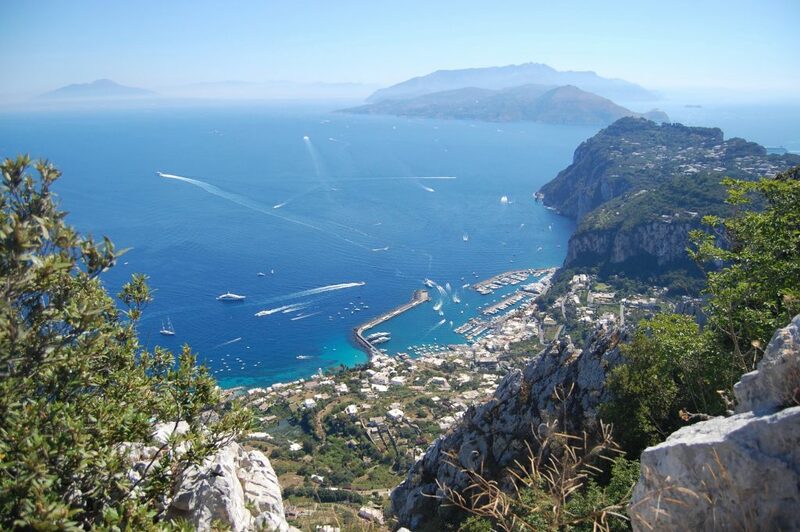 I’ve been to Sicily and mainland Italy several times but never to Capri. The process of getting there was long. 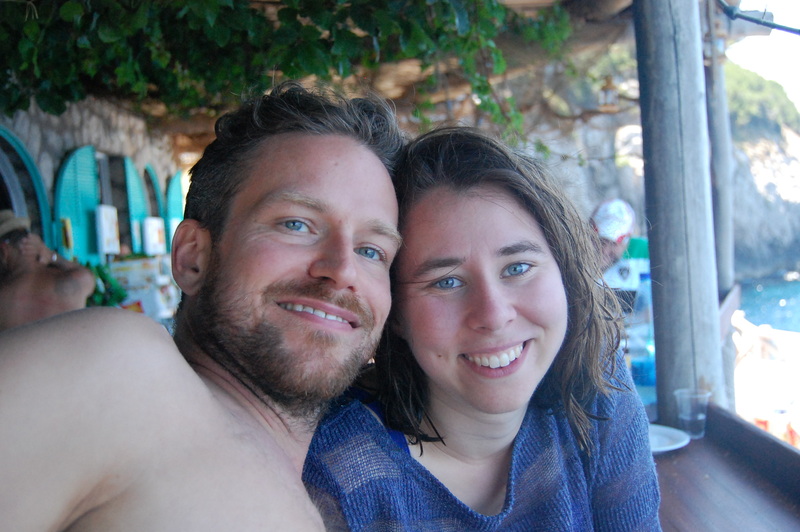 Elisabeth and I left home at 1.45am on Sunday morning, flew from Gatwick to Naples, then ferried across to Capri. I couldn’t get to sleep before we left so I was a bit numb to the world when we arrived on the island at 1pm that afternoon. When the ferry docked in Marina Grande (the main port), I felt the place was too picturesque to be real. The rows of coloured sailing boats in the marina, below a paved square of bright shops, and gelato vendors looked like a picture perfect scene. Being overtired and hungry at this point I’m surprised I could appreciate any of it. I curled up in the shade with the suitcases and my gluten free oatcakes whilst Lizzie went to meet Ben. 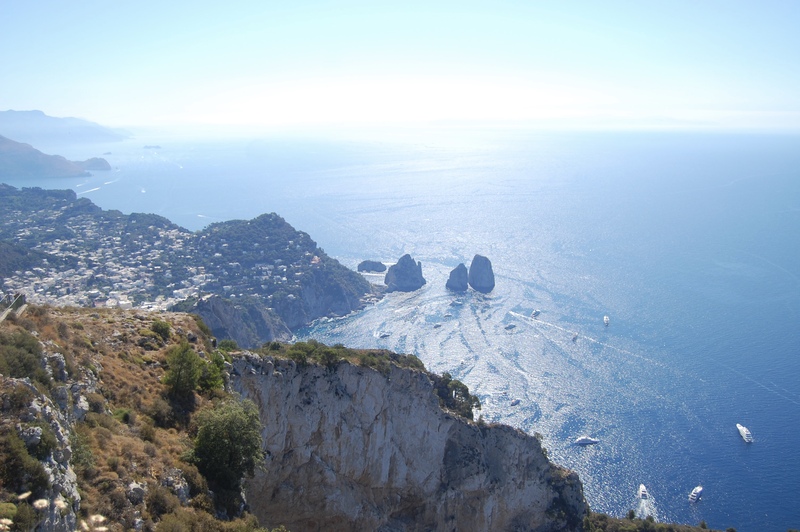 Capri has two towns, the main being Capri and to the west, where we stayed, Anacapri. The second being smaller and less touristy, you can see a more authentic example of local Capri life. Ben lives a few minutes walk from the little bus station in the town and everyday we took a minibus (packed like a tin of sardines) back and forth to some amazing places on the island. 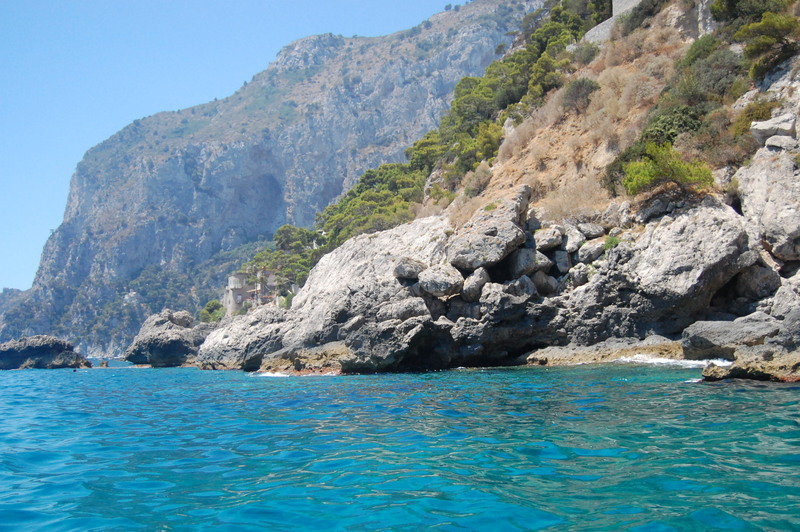 The Blue Grotto (Grotta Azzurra) and the beach beside it called Gradola, Marina Grande, Capri town and Faro beach. 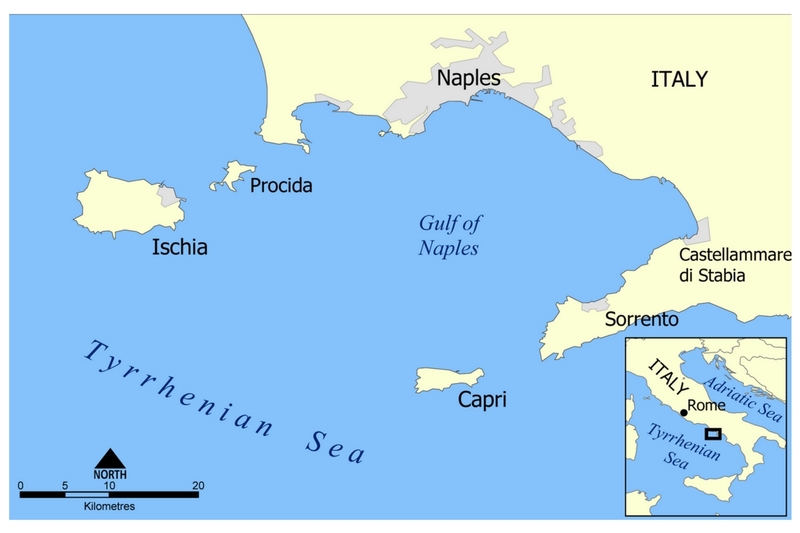 All the beaches on Capri are concrete platforms built into the sea with the exception of the beach at Marina Piccola (the little port) which is sandy into the shallows. 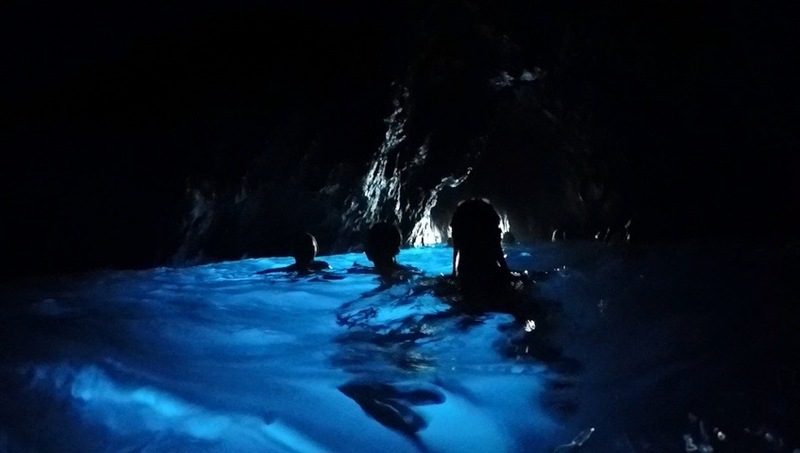 One well known site on Capri is the The Blue Grotto, a cave off the north west of the island that is lit with blue light because of a large hole in the rock below the surface of the water. 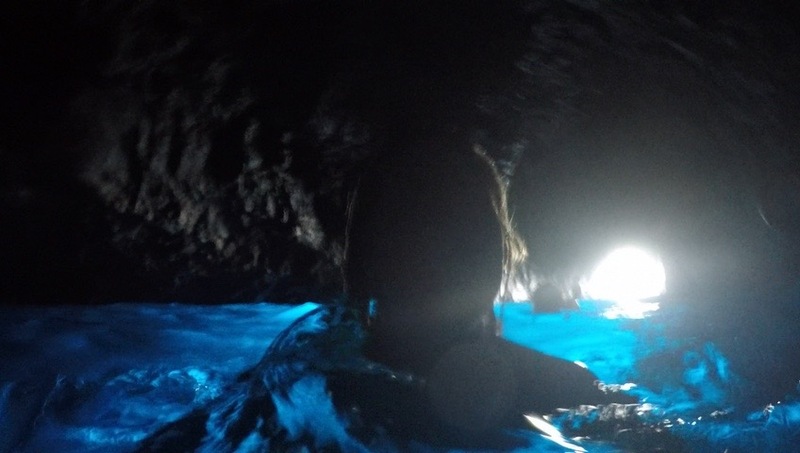 There are hundreds of grottos in the rock front around Capri, but this one is really special. 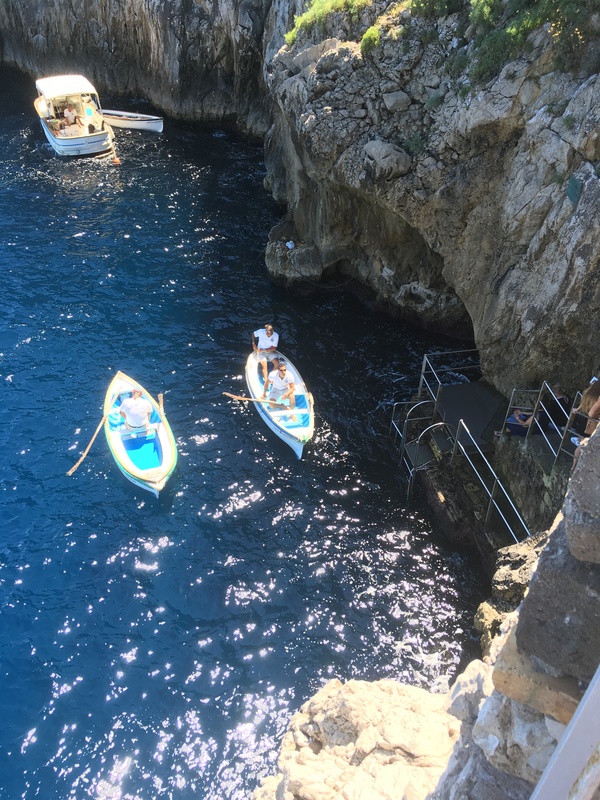 There are steps down the side of the cliff to the entrance of the Grotto. 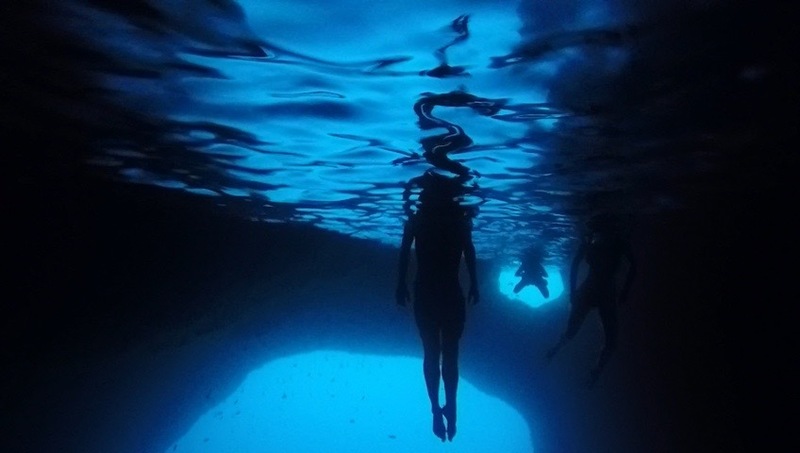 You then swim through a gap in the rock into a huge cave inside. 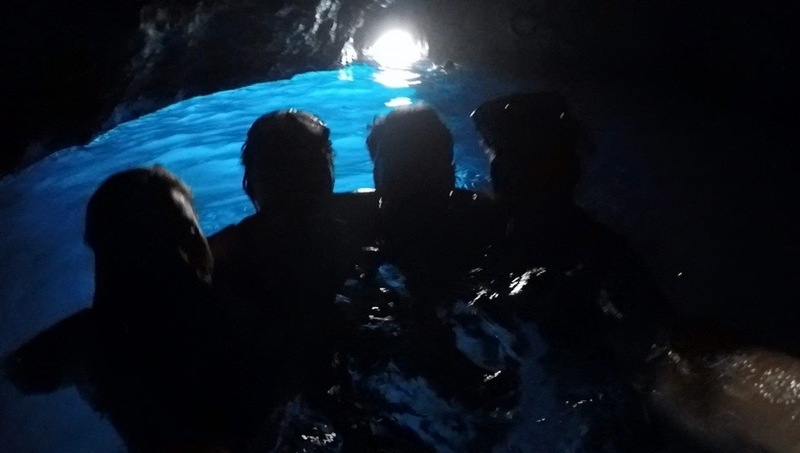 We swam into the cave through a narrow hole, just wide enough for a little boat. I took my GoPro in with us. The water really is that colour! 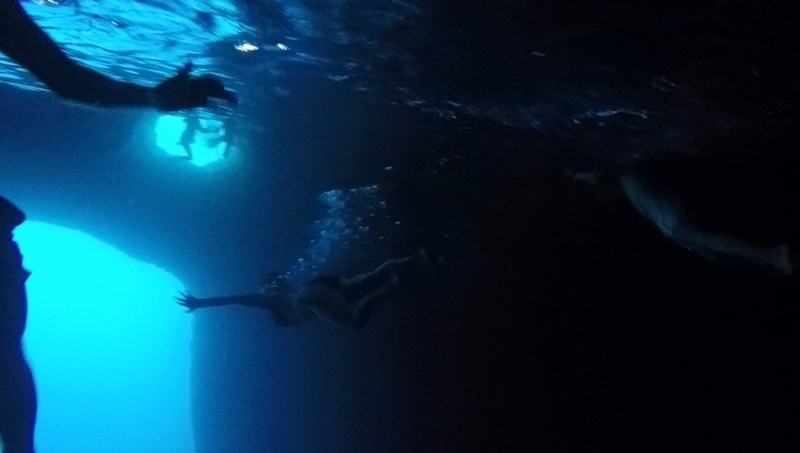 You can see how small the opening to the grotto is from under the water compared to the huge opening below it. There were lots of little fish swimming in the grotto too. 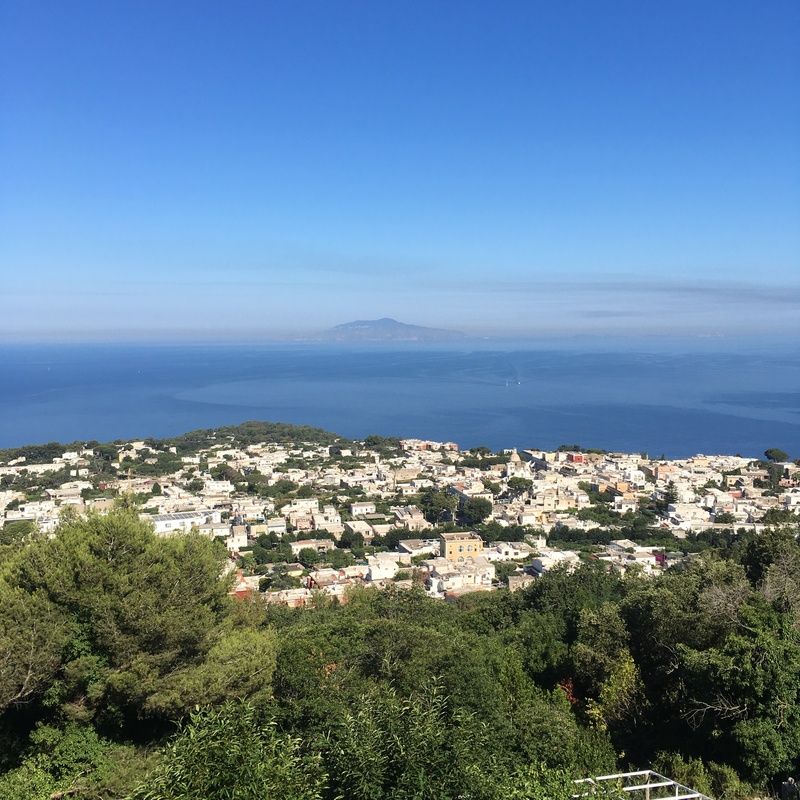 On Wednesday the four of us took a chair lift from Anacapri up Monte Solaro (1,932ft). 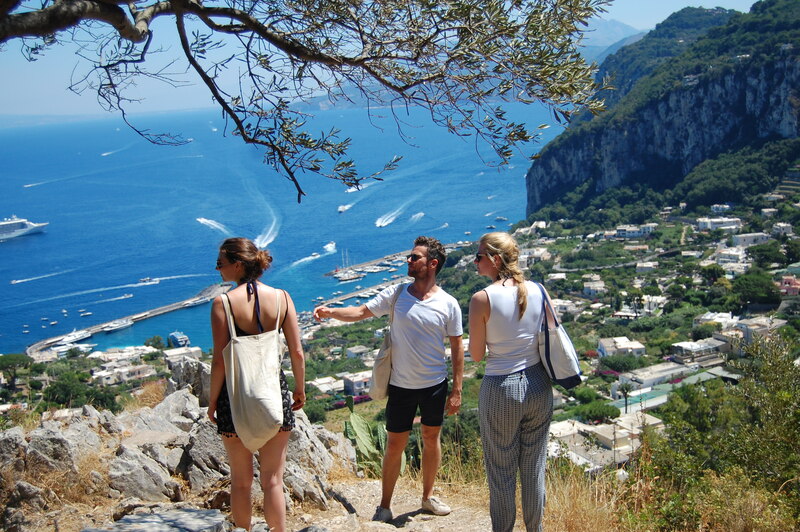 We then walked, climbed and scrambled back down the side of the cliff to Marina Piccola. Ben said it was a nice walk to do in the morning before it gets too hot, all you needed were shoes with some grip. 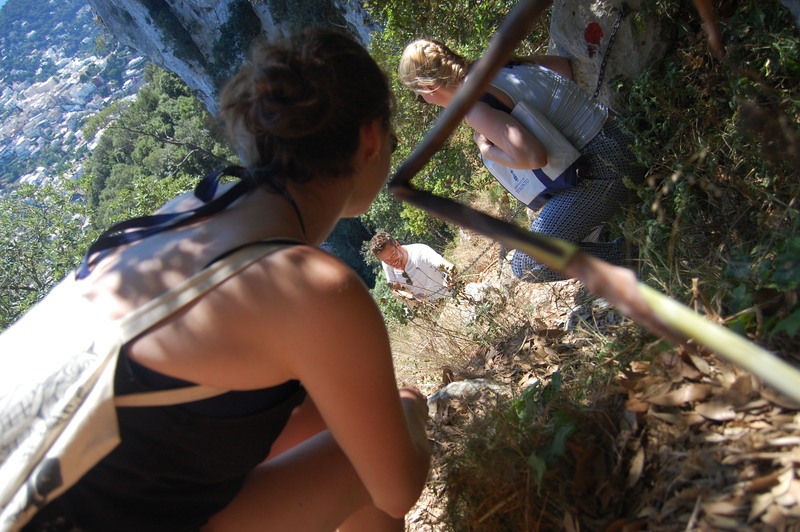 Elisabeth, Antonia and I (three innocent tourists) obediently followed him down a path, which then casually disappeared at the cliff edge! An old metal chain was bolted in the rock to aid those people crazy enough to climb the mountain. The view on the climb down really was spectacular. 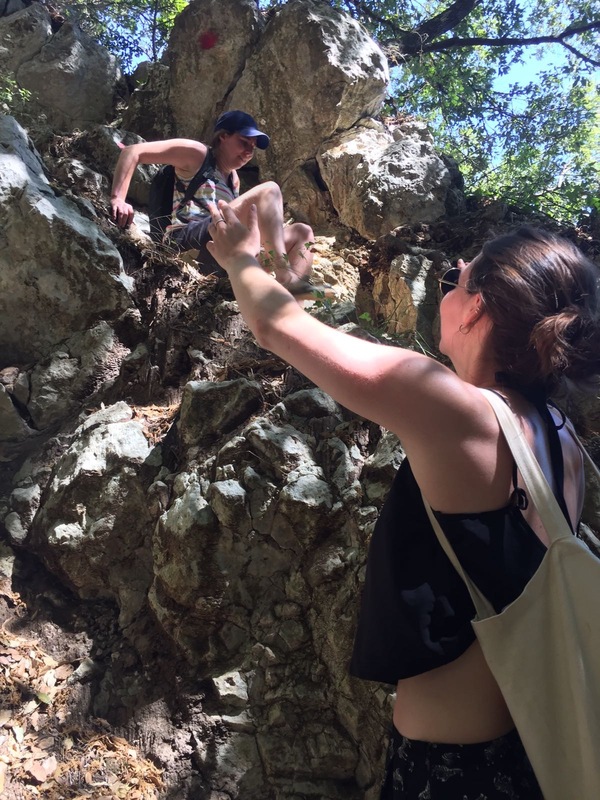 If you were able to appreciate it, whilst clinging to the rock face and thinking about how your brother has an unhealthy appetite for thrill seeking. 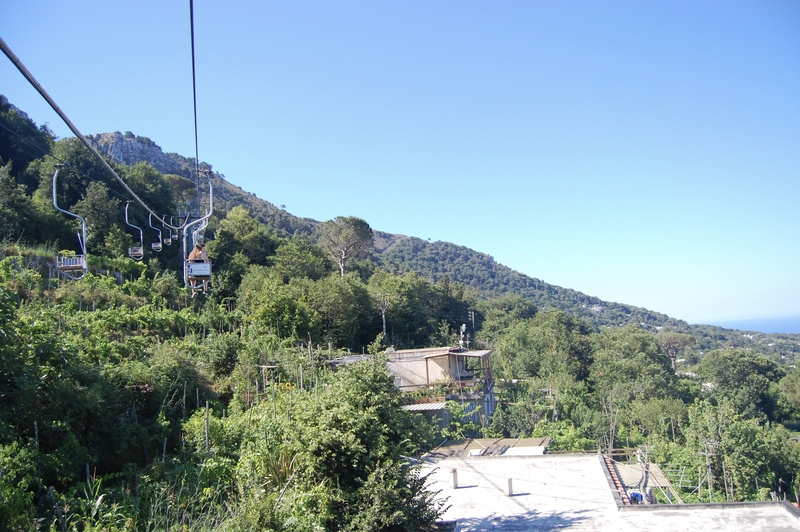 View from the chairlift overlooking Capri with Mount Vesuvius and the mainland in the distance. We could see the forest fires spreading on Vesuvius before we left at the end of the week. 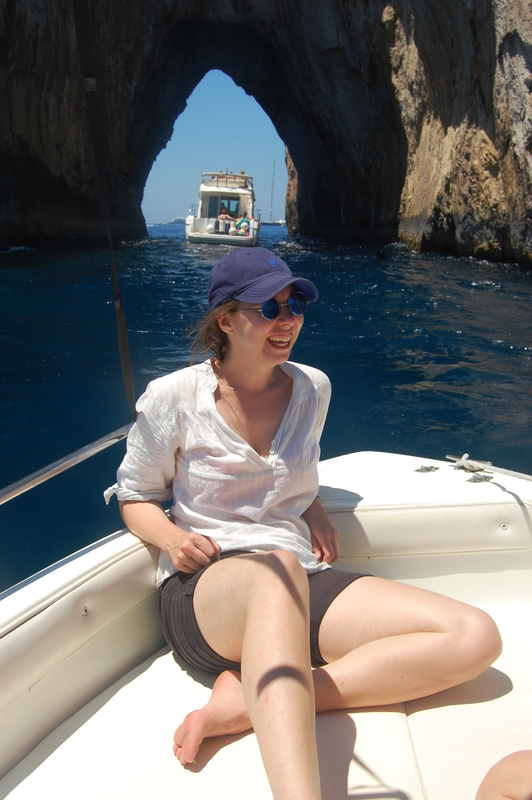 One of my favourite days was when we hired a boat and drove all the way around the Island looking for more grottos to explore. The water was perfect, salty, but really warm, and after a number of attempts, I successfully managed a back flip off the side of the boat. I kept landing flat on my back… very painful, I wouldn’t advise a back flop to anyone, eeeeeshhh! 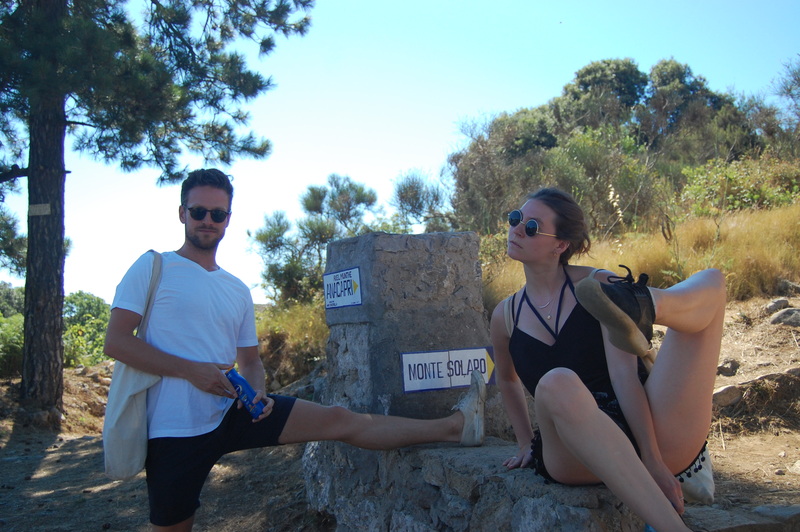 My favourite things in Capri? 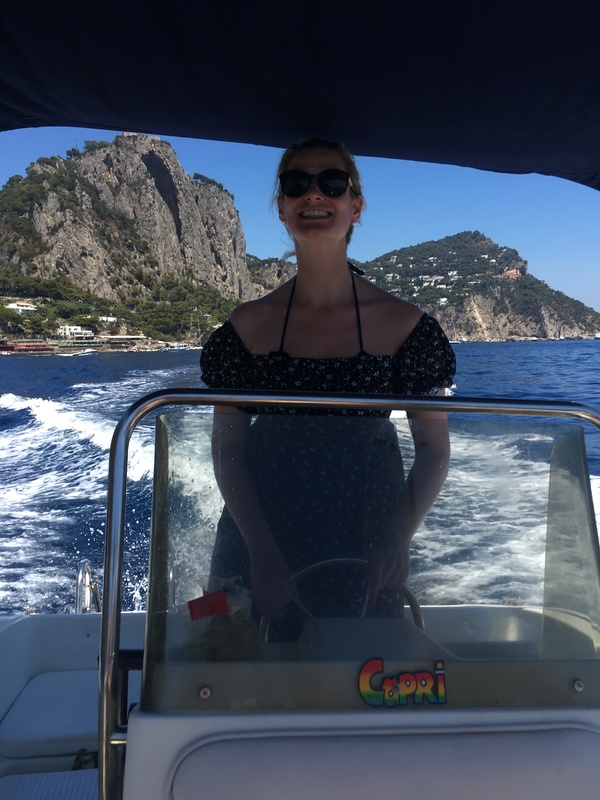 Our week in Capri was incredible, non stop and amazing fun. I love being by the sea, especially if it’s warm enough for swimming. 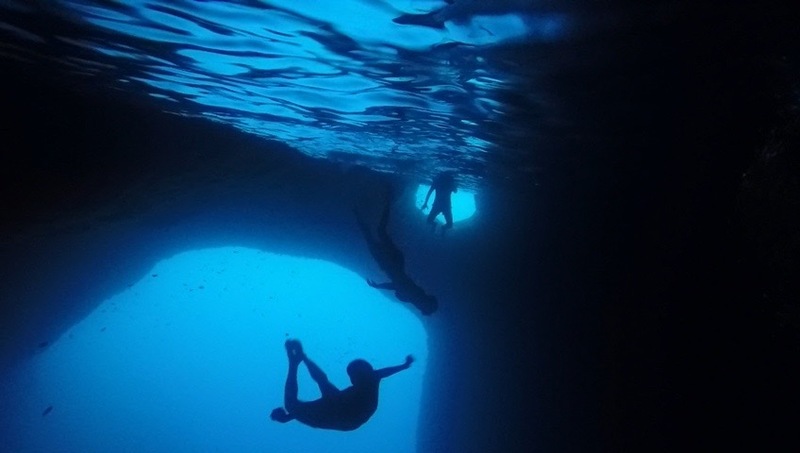 The water is so salty in Capri it’s difficult to swim far below the surface without your ears and chest hurting. The water is very clear and I really enjoyed looking for different types of fish swimming around the beach. 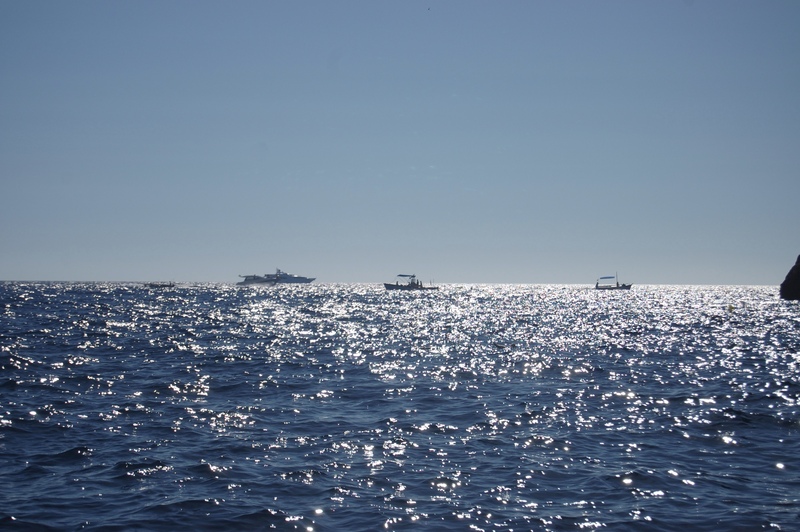 Though sometimes it was nice to just float on the surface of the water in the sun. I also spent time in Ben’s garden looking at lizards, and on one occasion, Stevie the gecko. Apparently there are snakes as well but they kept out of our way. Ben has a wonderful cactus in his garden, planted the same year he was born, which flowers once a year for one day. There are lots of these on the island and the flowers are beautiful and easy to miss. Ben also has a thriving apricot tree. We had apricots with lunch and dinner every day whilst we were there. He’d collected a bowl of ripe ones in the fridge, which contained about a hundred, so, apricot jam anyone? 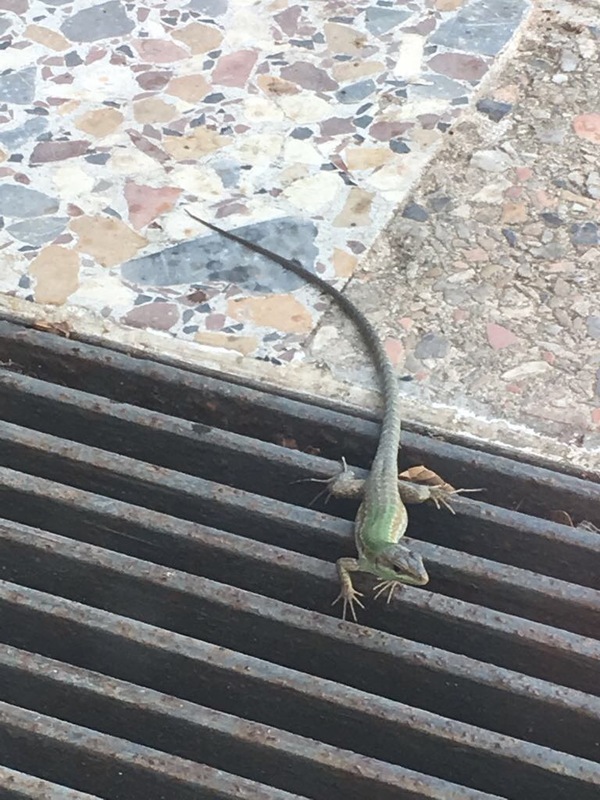 Lyle the lizard lives on a wall by the back door. He’s showing us his best side.